Kenny’s Pond Retirement Residence has 6 floors and 115 suites. 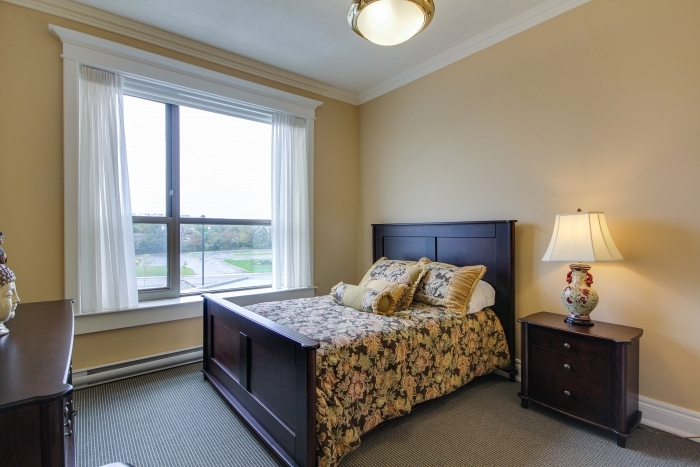 There are four floors of Independent Living and two floors dedicated to Assisted Living where additional care is provided based on an individual’s specific care needs. There are approximately 30 suite layouts falling under the categories of studios, one bedroom and two bedroom suites. Suites range in size from 325 square feet to 917 square feet and range in p rice according to size, layout and view. 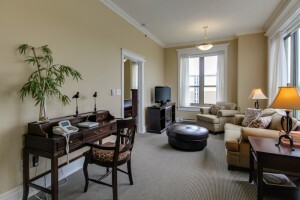 Each suite is equipped with a kitchenette complete with refrigerator and microwave, safety- equipped bathrooms with a step-in shower, window coverings and carpet, individually controlled heating, smoke detectors and sprinklers, as well as a state of the art emergency response communication and 24 hour monitored alarm security. All suites are unfurnished, so that residents moving to Kenny’s Pond bring in their own furniture and belongings, as well as pictures and décor items that are suited to their own taste and style. We encourage all residents to make their suite their very own, while right- sizing to the space and layout as they have specifically selected.